Is this the most legendary road trip in Outback Queensland? Embarking on any Outback Queensland road trip is an adventure like no other, but there’s one route that could take the cake. It’s long, it’s epic and the best part, it straddles the Outback south and North Queensland coast. 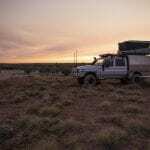 Titled the ‘Journey of the Gulf Savannah’ by Outback Aussie Tours, this whopping 14 day itinerary packs in quintessential outback experiences into 1731km of tarmac. From red dirt and dinos to an outback oasis, pack your bags and set out for two weeks of ultimate adventure with this legendary itinerary. The road trip begins in Longreach, giving you the freedom to choose how to get yourself to the heart of the outback. Take your road trip to the next level and start early by motoring into town from Brisbane (13 hours/1,170km), Rockhampton (7hrs/680km), or Townsville (8.5hrs/775km). Once in town, spend the next two days exploring. From classic outback shows to learning about the town’s aviation history, check out what to get up to while in Longreach with this guide. Make your way from Longreach to Richmond, a 5.5 hour journey through dinosaur country. Following the Matilda Way north from Longreach, the first pitstop is Winton. Here’s where your dinosaur trail begins with a visit to the Australian Age of Dinosaurs and Dinosaur Stampede at the Lark Quarry Conservation Park. Follow the dino tracks north-east to Hughenden to say hi to ‘Hughie’, the seven metre, life-size replica of a Muttaburrasaurus who lives at the Flinders Discovery Centre. Finish off your dig for dinos by heading west to Richmond, where you’ll be greeted with a pristine collection of marine reptile fossils at Kronosaurus Korner. Although it’s only a 4.5 hour road trip from Richmond to Mount Isa, there’re two towns along the way that are a must-visit en route. Stop in at the quaint town of Julia Creek to see the endangered Julia Creek Dunnart, surely one of the cutest species on this list. Two of these adorable creatures (named Donald and Duncan) can be spotted at the Visitor Information Centre for a guaranteed encounter with this shy marsupial. Trek further west to Cloncurry for a heart-warming visit to the John Flynn Place Museum and Art Gallery to learn about the history of an Outback essential – the Royal Flying Doctor Service. Take a stroll around Mary Kathleen Park, and stop by ‘Cloncurry Unearthed’ (the Visitor Information Centre) to learn more about the town. Can’t get enough of ‘The Curry’? Stay a bit longer with this 48 hour guide. Once in Mount Isa, kick back and relax in this patch of cowboy country with a bevo at the Isa Hotel. Spend the next day at the picturesque Lake Moondarra and exploring the town’s mining roots with a tour down under at the Hard Times Underground Mine Tour. Follow this 48 hour guide to make the most of your stay. It’s time to turn north and burn 320km to Adel’s Grove, located in Boodjamulla National Park (Lawn Hill). Kayak down the calm waters of the grove, marvelling at the dusty red rocky escarpments framing and contrasting with the emerald greens of the canals. Wake up to this outback oasis from the comforts of an air-conditioned ensuite room, or immerse yourself in the experience with a stay in a safari tent. Leave the lush surrounds of Adel’s Grove and point your bonnet north in the direction of Karumba. Here you’ve got a choice of driving the 500km journey, or boarding a scenic flight with Aussie Outback Tours and arriving in the Gulf of Carpentaria in a flash. If you’re committed to life behind the wheel, turn your tyres north-east. This track takes you through Normanton, where it’s mandatory to snap a shot with Krys, the Savannah King. At 8.6m, Krys is the life-size replica of the largest croc to be caught in the world. Crikey! Once in Karumba, jump straight onboard a cruise to enjoy the sunset over the water with a seafood feast. Make the most of this ‘outback by the sea’ experience by spending the next day casting a line and strolling along the banks of the Norman River. 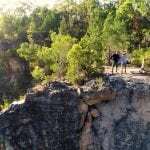 After a 460km trek south-east, you’re in for a treat at Cobbold Gorge. Discover the giant sandstone structures of the gorge with guided tours to suit your pace from a boat cruise to stand up paddling the narrow waters. Don’t forget to snap a picture of this 135 million year old natural wonder, with it’s towering arches that meet the mirror-like water creating a stunning outback landscape. Back at the accommodation, take to one of the walking tracks or kick back and relax in the infinity pool that has the outback’s first swim up bar. A 48 hour stint can just as easily be spent at this outback gem, with a stack of activities like bird watching, fishing, and kayaking to keep you occupied. Say sayonara to the outback as you leave a gust of dust in the review mirror. Make tracks towards Tropical North Queensland onwards to Cairns. This legendary road trip comes to end at Cairns, a 460km journey from Cobbold Gorge.